Scan and sign-on-glass PDA&rsquo;s for Allied Express courier and distribution fleet. 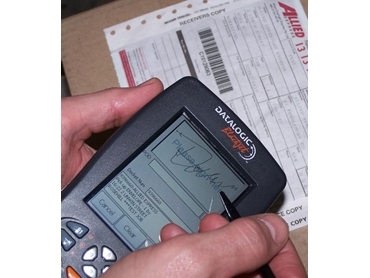 Home > Scan and sign-on-glass PDA’s for Allied Express courier and distribution fleet. Allied Express Transport has released a major roll-out of scan and sign-on-glass PDA’s (personal digital assistants) for its entire courier and distribution fleet. After exhaustive evaluation, Allied Express Transport chose the Datalogic Blackjet PDA partly because of its compact size and robust construction, but also its technological superiority and overall ease-of-use. Scanners with signature panels are by no means new, but what is ground-breaking is the combination of application modules contained in the Datalogic Blackjet units. Within each unit is the capability to scan a consignment-note, record a signature on glass as proof of delivery, and then upload this data immediately to Allied's management system via GPRS (general packet radio service). GPRS is designed to deliver a high-speed data packet over existing GSM mobile phone networks, rather than by the less reliable two-way radio method. In addition, Datalogic Blackjet units have WiFi (wireless fidelity) for applications where a closed, RT communications environment would operate, such as in a warehouse. Here the units might handshake with an inventory-control or ERP (Enterprise Resource Planning) system. ERP systems are designed to integrate all data and processes of an organization into a single, unified system. Central to Allied's requirement was the need for an integral GPS tracking function. None of the units being considered, including the Blackjet, came with this feature. However an ingenious answer was found in Datalogic's Bluetooth function. This allows it to talk to a separate Bluetooth-friendly GPS receiver mounted in the vehicle…so it was problem solved. According to Allied Express, having this capability has turned out to be an added bonus. The ability to talk to other Bluetooth devices such as printers has opened up a potential direction for future service initiatives. Some of its clients have indicated that a printed delivery advice left with their customers by the driver would be beneficial. With these units the capability is, literally, in the palm of the driver's hand. The use of these units will remove areas of potential error from the delivery process for Allied. Immediate transmission of scan and signature data means no delay in upload, and no loss of this data through buffer memory limitations as suffered by the old docked units. Data is uploaded within seconds and then viewable on Allied's website. It is a degree of delivery transparency and accountability that is ground-breaking for the industry and, Allied believes, unprecedented on such a wide scale. Each Datalogic Blackjet is like an extension of Allied's entire operational process. That square of glass is a window into a powerful, national logistics machine that serves some of the biggest names in the country.